The paired, air-filled, elastic, spongy organs occupying each side of the chest and separated by the heart and the central partition of the chest known as the mediastinum. Each lung is surrounded by a double-layered membrane called the PLEURA. The function of the lungs is continuously to replenish the oxygen content of the blood and to afford an exit path from the blood for carbon dioxide and other unwanted gases. The right lung has three lobes and the left two. An air tube (BRONCHUS) and a large artery and vein enter each lung on its inner aspect and these branch repeatedly as they pass peripherally. The smallest air passages end in grape-like clusters of air sacs, the alveoli, the walls of which are very thin and contain the terminal branches of the blood vessels. In this way the air comes into intimate contact with the blood so that interchange of gases can readily occur. tests for assessment of the function of the lungs ( aka respiratory function tests) to aid diagnosis of respiratory disease and assess effectiveness of treatment. 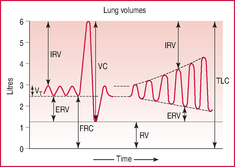 Includes methods for measuring lung volumes and gas transfer. In sport, primarily used in the diagnosis and monitoring of treatment of asthma, especially exercise-induced asthma; WADA guidelines have now set criteria based on such tests, whereby an athlete may use certain inhaled medication. See also blood gases. measurements made as part of pulmonary function tests; the volumes that move in and out during the normal breathing cycle, and with deliberate additional effort, can be measured directly by spirometry with the subject breathing through a closed circuit in and out of a cylinder inverted over water, or into a vitalograph, or by pneumotachograph; the residual volume can be measured only indirectly by dilution methods (usually with helium) or by whole body plethysmography. See also ventilation. See figure and table overleaf . The work led by Jackson Laboratory professors Frank McKeon and Wa Xian sheds light on the inner workings of the still-emerging concept of lung regeneration and points to potential therapeutic strategies that harness these lung stem cells. Despite what we thought, bigger lungs turned out to be better, said Christian Merlo, MD, a lung transplant expert at the Johns Hopkins University School of Medicine and senior author of a study published in the August issue of The Annals of Thoracic Surgery. A heart-lung transplant can offer hope to someone dying of a terminal chronic lung disease. It means that many of the lungs that could be used are nor suitable because the function is not good enough because they are damaged. No one expected the number of tsunami lung cases we saw," says Systrom. In some women, these cancers later spread to the lungs. Discovery's Surfaxin is an engineered version of natural human lung surfactant and contains a peptide, sinapultide, that is designed to closely mimic the essential human lung surfactant protein B (SP-B). BURBANK - John Bradford Goodman spends 16 hours a day in an iron lung that keeps him alive with the steady working of its engine. On June 20, 1816, Peter Lung began the journey from his Middletown, Connecticut, jail cell to the gallows that had been erected for his execution. The industry exerted its political power in state after state to ensure that workers' compensation did not cover miners' asthma, except silicosis, a severe form of black lung visible in x-rays. Nicotine enters the lungs, where blood absorbs it and delivers it to the brain within 8 seconds. The excess muscle cells can block the airways, trapping air in the smallest air compartments in the lung (alveoli) and causing the person with LAM to have difficulty moving air out of the lungs.